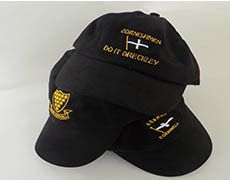 Our Cornish Caps in classic black are made from 100% cotton. Adjustable fit with strap to back, embroidered eyelets for added ventilation. One size fits most! Diameter 18cm. Distinctive gold embroidered Cornish design front panel.Make your choice from those listed below.